Founded in 1893, the Chicago Columbia Club is one of the longest continuously-running woman’s social clubs in Chicagoland. For Christel Schmidt, the 125th Anniversary of the Chicago Columbia Club celebration at Chicago’s Woman’s Athletic Club was especially sweet. Glowing with light, laughter, and the conversation of special guests and members, the event brought back memories of Schmidt’s first times with the group. Schmidt couldn’t be prouder that the club, which was founded in April of 1893, is still going strong, with 140 members, and the same mission as when it began: To celebrate German culture and to enrich lives through the fellowship of other women, the arts, and lively discussion around literary topics of interest. 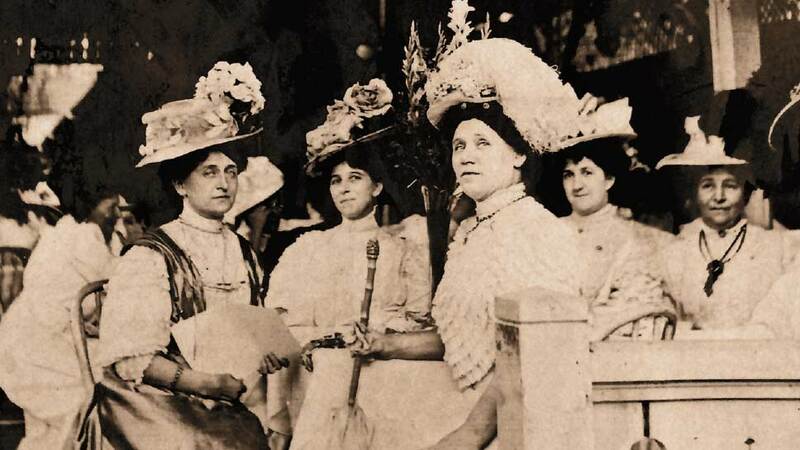 Originally called The Columbia Damen (“ladies” in German) Club, the group was formed as Chicago was about to host the World’s Columbian Exposition, and the German immigrant population here was thrilled to participate as a big part of the host city. For context, although it’s difficult to imagine in Chicago’s current melting pot, in 1893, one of every four of Chicago’s 1 million residents was of German heritage. The German language was taught in schools, there were four German newspapers and German clubs and organizations were very common. Here’s how the woman’s club came to be: As part of the world’s fair, a World’s Congress Auxiliary for Higher Education was planned to discuss the future of education here and at large. Prominent Chicago women of German heritage were invited to represent the German community for guests who would be arriving. And Mrs. Harriet Brainard, head of the auxiliary needed advice on the best German education theorists to invite to the Congress. The club never had its own clubhouse, but rather, met every first Thursday of the month from October to May at locations including Germania Club, the Walnut Room at Marshall Field’s, and the Edgewater Beach Hotel, until settling in at the Woman’s Athletic Club in 1973—still the club’s current home. Then as now, typical meetings of the group started with a presentation on different topics in German or a musical or oratory performance, followed by a lunch (note one meeting per year is held in English). Over the years, presentations have been made by visiting professors on topics as wide ranging as “The Relationship between Richard Wagner and King Ludwig of Bavaria,” to “A Cure for Diabetes” and a presentation about Albrecht Dürer. Traveling artists and prominent German-Americans living in Chicago have come. Members of the Lyric Opera Orchestra and the Ryan Opera Center have performed and so has the Vienna Boys Choir and the Bach Week Festival Choir. Throughout the years, the club has done philanthropic work—everything from supporting the Red Cross to promoting German theater in Chicago. As well, to continue in its tradition of furthering German education and culture, the club has provided a university scholarship to a deserving student in German studies–the “Chicago Columbia Club Helene Lange Fellowship,” every year since inception. “While the number of members goes up and down, the club continues to be a place of friendship within the Chicagoland German community. We have old people and young people, new Chicagoans and long-time expats who all care so much for one another. It’s such a privilege to be together,” sums Schmidt. The club is open to German-speaking women, with invitation by a sponsoring member. For more information, visit columbiaclub.org.